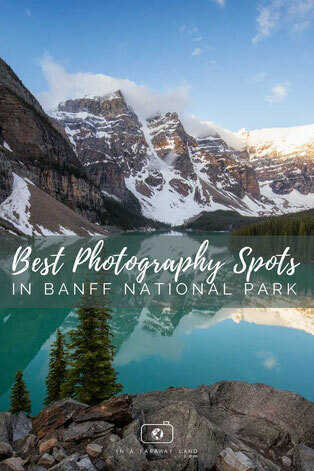 Probably one of the most frequently asked questions floating around Canadian Travel Forums, Facebook Travel Photography pages and a question I get emailed all the time: what are the top photography spots in Banff National Park? Personally, I find that the more remote the place is the more beautiful photographs I manage to capture. 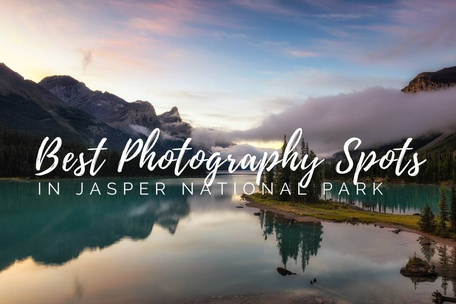 I have hiked through and photographed countless trails around the national parks of the Canadian Rockies and documented it all in my hiking guide. I do understand that not everyone wants to venture off into the mountains either due to lack of interest, limited fitness level or lack of a travel buddy (visiting remote areas of the Rockies as a solo traveller is not a good idea). The answer to that problem is to stick the the spots that are easy to get to. 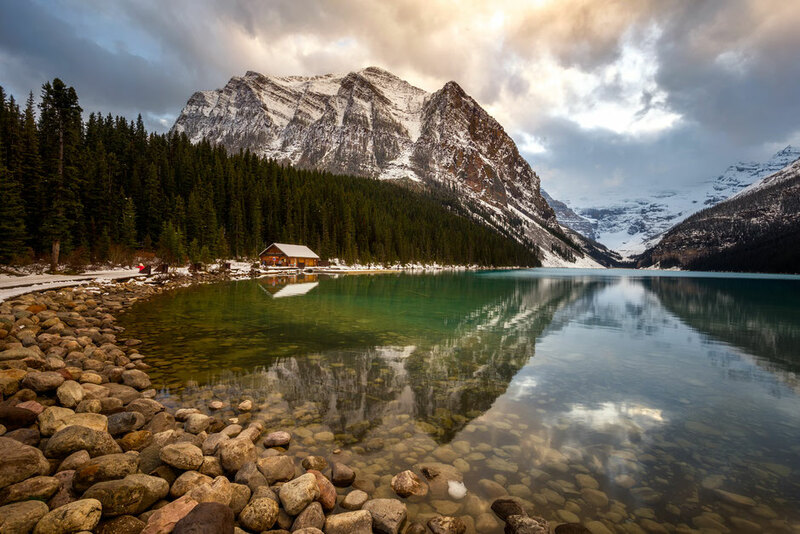 However do consider that as the amount of tourists visiting the Canadian Rockies grows year after year, inevitably these photography spots become more and more crowded. If you want the best photos, and the best shooting conditions, visit them at sunrise or sunset. 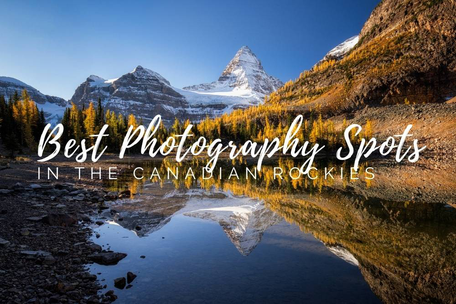 If you're a photography lover coming to these spectacular mountains then consider following one of my road trip itineraries around western Canada. Please note that I have deliberately left out some photo spots on the Icefields Parkway, which I have enlisted in a separate post. 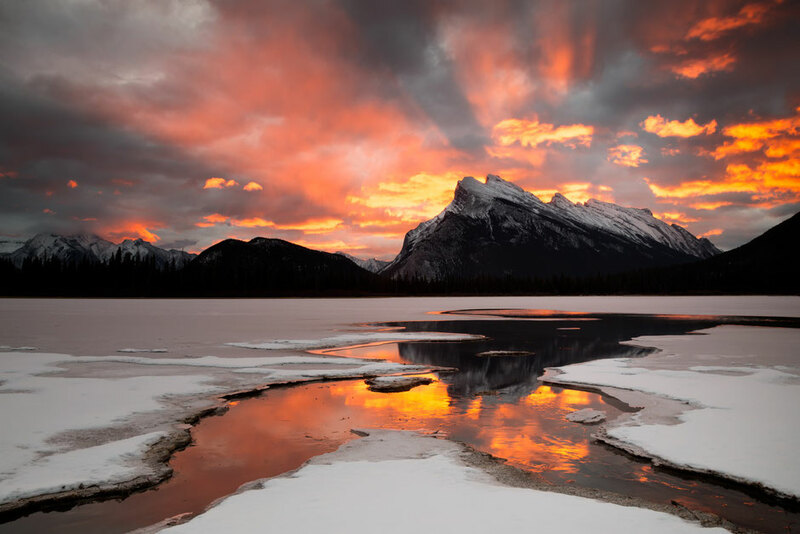 Vermillion Lakes consists of 3 main lakes, all of which are around a 5 minute drive from the centre of Banff. Easily accessible either by car or by foot. 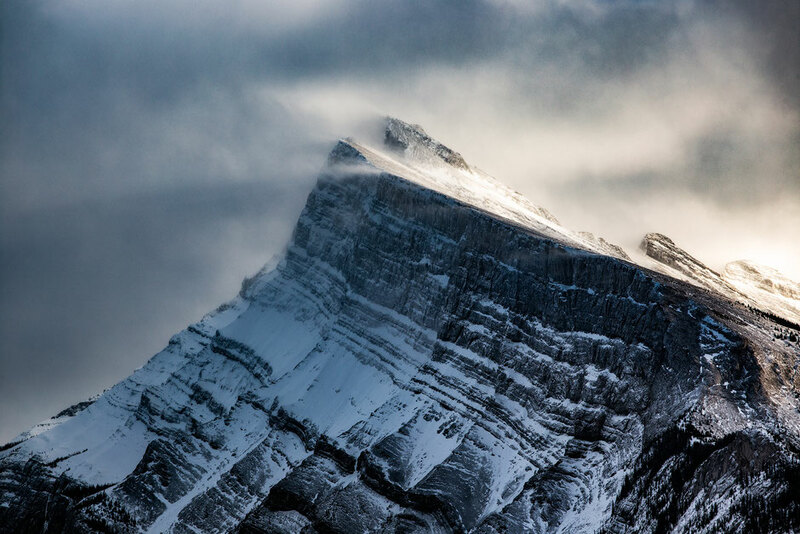 There is lots of vantage points along the shoreline to capture the reflections of the iconic Mount Rundle. My favorite time is when the lakes start to freeze in November creating interesting ice formations on the lake. Another beautiful lake close to Banff - Two Jack Lake is around a 15 minute drive from the town centre. Similarly to Vermillion Lakes it offers fantastic reflections of Mount Rundle (from a different angle). 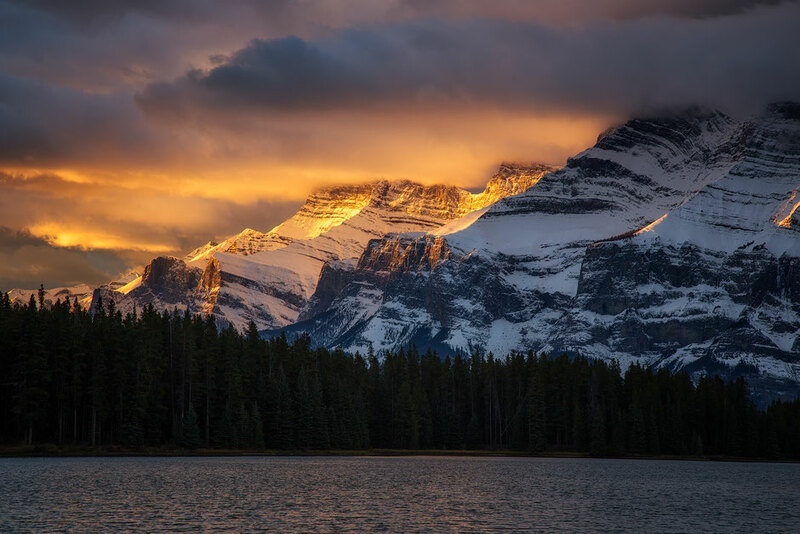 The picture above was taken during a very moody sunrise when the face of the mountain lit up in the morning sun. 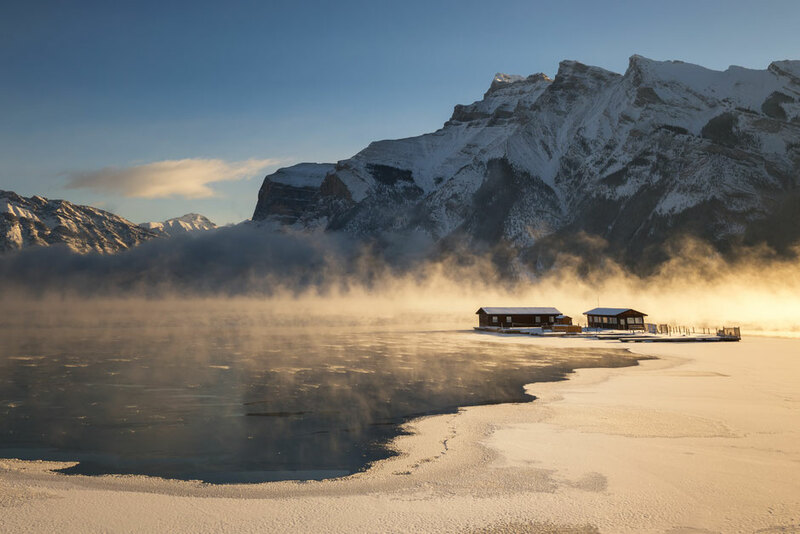 Close to Two Jack Lake, Lake Minnewanka has been used by the First Nations Communities 10,000 years ago. Facing north, it's a very popular place to view the Aurora Borealis. My favourite views are the ones of Mount Inglismaldie. 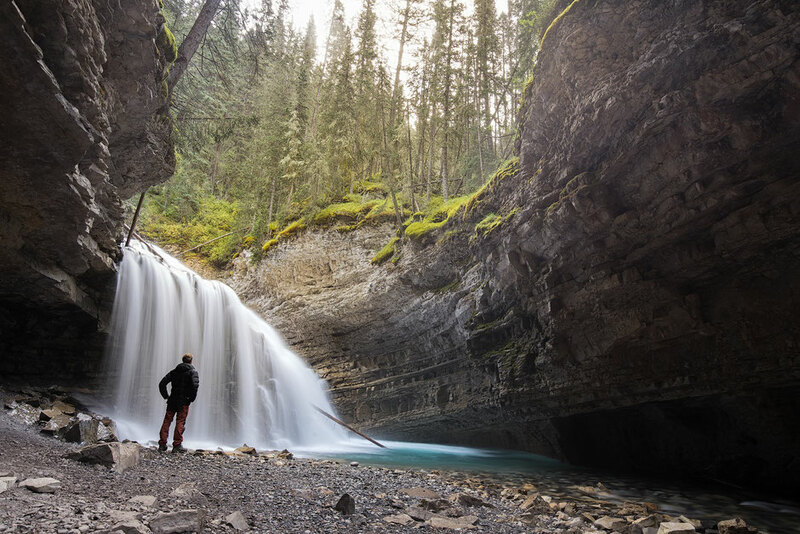 Johnston Canyon has a few photography spots, the upper falls, the lower falls and the horseshoe bend being the most prominent of them all. It's one of the better hikes in Banff National Park too but gets seriously busy on a summer day during peak season in July and August. Johnston Canyon lies on the Bow Valley Parkway and it's around a 30 minute drive from Banff. After the Canadian Pacific Railway was completed their photographer (Nicholas Morant) snapped this curve of the Railway many decades ago and it made its way into history. Till this day, more than 70 years later, it remains a popular photography destination. 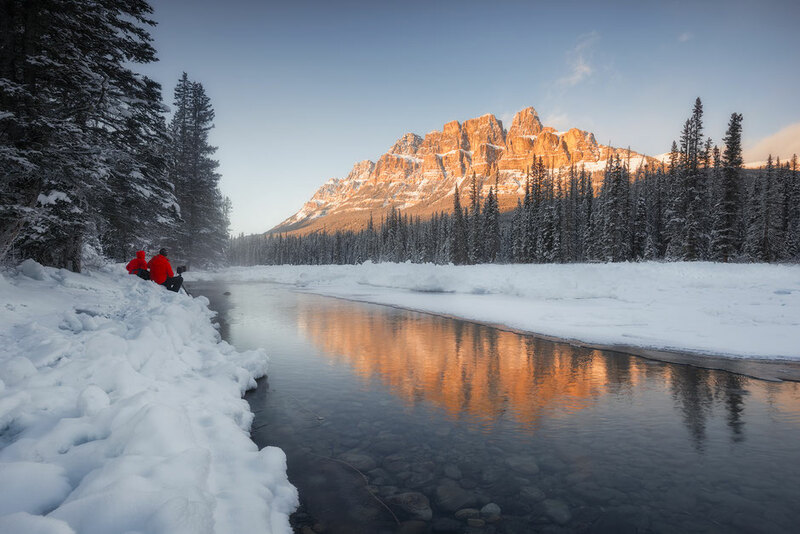 It's on the northern section of the Bow Valley Parkway, not too far away from Lake Louise and a 45 minute drive from Banff. This mountain lies in the middle of the Bow Valley Parkway, a stretch of road that features in my itinerary for outdoor lovers coming to the Canadian Rockies. The castle's moat offers a great foreground for framing the fortress excellently. For access, you need to head through the wildlife gate on the left hand side of the river (if you're looking upstream from the bridge). Please make sure the gate is closed behind you to stop wildlife venturing onto the highway. 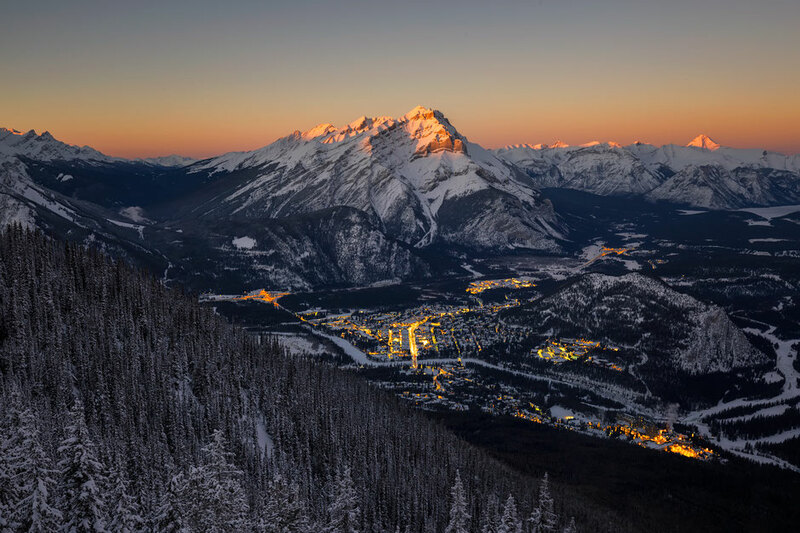 In the winter, Mount Norquay is one of the many ski fields that surround Banff. In the summer the road isn't that heavily used and the viewpoint up there is somewhat forgotten about. However it offers an amazing view of Banff toward Mount Rundle all times of the year. A ten minute drive from the centre of Banff. The gondola in Banff takes you up almost 3000ft up above the town and is a great place to take photos, especially at sunset. If you like hiking then it's possible to walk up there too. It takes around 2.5 hours to get to the top and you can reward yourself with a soak in the Banff hot springs when you come back down. I saw countless photographs of Moraine Lake long before I even knew where it is or what it was called. Its fame is definitely justified. When I first stood on its shore I felt my eyes tearing up. The road to Moraine lake stays open only from May to October and pretty much gets instantly swooped by thousands of tourist. The car park often fills up as early as 7am! The iconic view from the pile of rocks at the tip of the lake is around 200 meters from the car park and is where you can capture those postcard worthy photos. My only pledge to you is to try and stick to the designated paths! Way too many photographers completely ignore the signs and step over fences, chasing the unique shot, tramping whatever vegetation's left. If you must, use rocks to hop on. Remember if we don't treat those places with respect there will be nothing to look at for future generations. Moraine Lake also marks a starting point for many amazing hikes in this area. If you look out of the window of Chateau Lake Louise, this is the view you'll get. A turquoise green lake surrounded by huge mountains. The shoreline marks the trailhead for many of the best hikes around Lake Louise in Banff National Park. The most popular focus point for photography is either the hanging glaciers at the far end of the lake or the boat jetty pictured above. Lake Louise is around a 45 minute drive from Banff. 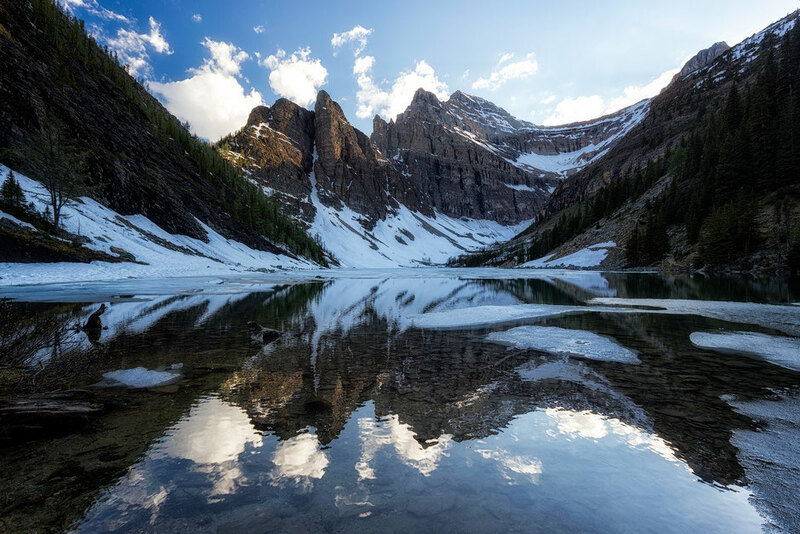 Lake Agnes is the only spot on this list that requires a bit of an effort to get to. It's an hour or 90 minutes easy uphill walk. A little exercise won't hurt anyone and if it means sitting and taking in the views on the shoreline of this lake then you can be rest assured that it was worth it. To get there start your walk along the shoreline of Lake Louise, once you go pass the famous Chateau you'll find signs pointing to the trail. Surprise Corner is a 5 minute drive from the centre of Banff. 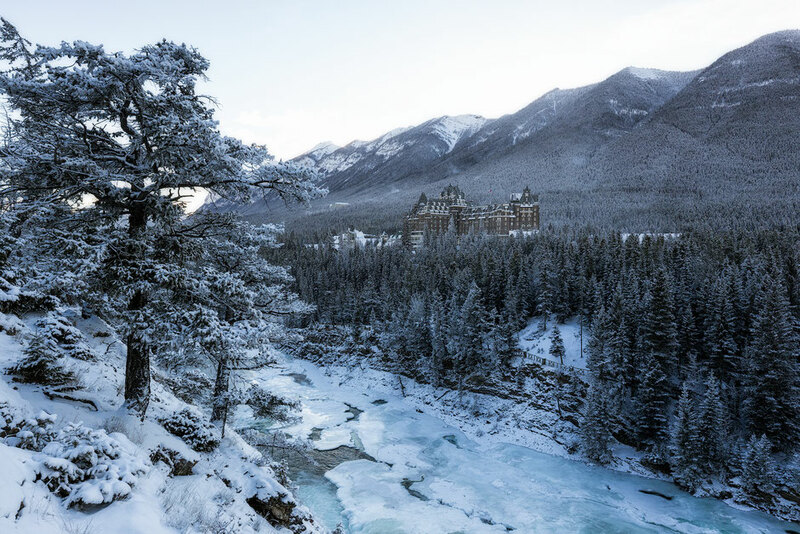 It's the ultimate spot to capture a photograph straight out of a fairy tale, with the famous Banff Springs Hotel as a centre point. Finding all photography spots mentioned above is easier said than done. Below you'll find a map with all locations marked on it. Click on the point you want to check out. A description of the point will appear on the left. If you'd like to get detailed directions on how to get there, click on the white arrow on the right side of the red strip. You're welcome!